Tadpole Productions second show for this year is guaranteed to be as popular as previous hits such as The Lion in Winter, Last of the Red Hot Lovers, Driving Miss Daisy, The Woman in Black and Absent Friends. The internationally acclaimed, multi-award winning play by Marie Jones,Stones in his Pockets, will hit the stage in Auckland for a limited season, from 16th October this year, directed by Andrew Foster. The play had a four year run on London’s West End, won Best New Comedy at the Laurence Olivier Awards and was nominated for three Tony Awards on Broadway. The moving yet hilarious tale of a quiet Irish community turned on its head when a Hollywood film shoot takes over the village is to be staged at the PumpHouse Theatre in Takapuna. The fifteen characters who inhabit the show are brought to life by two great actors, known for both their TV and stage work, who play all the roles between them. Emmett Skilton (The Almighty Johnsons, Home by Christmas, Tribes) and Phil Peleton (Outrageous Fortune, Nothing Trivial and Tadpole’s Driving Miss Daisy and The Woman in Black). Set in County Kerry, Ireland, a little rural town is suddenly overrun by a Hollywood film crew and most of the inhabitants are employed as extras for the shoot. The efforts of the films production managers to create what they perceive as authentic Irish culture creates many of the comedic moments in the play, which centres around two friends, Charlie and Jake, who are originally attracted to the novelty of a film shoot. As the glamour wears off and real life takes over, different priorities over a tragedy in the town cause friction, as conflicting personal agendas are revealed. This play is both moving and hilarious and one not to be missed. Marie Jones’ tragicomedy Stones in his Pockets has won international acclaim since it first premiered (1996) in Ireland but the award-winning production offers its audiences much more than a simple recipe for commercial success. Set in County Kerry, an American feature film crew have suddenly descended on a rural town to shoot the inevitable joining of hands between Maeve, the daughter of landed gentry, and Rory a local peasant lad. Despite its hogwash sentiment, this conventional American clash-of-the-classes-turns-to-unrequited-love provides opportunities for locals to make some extra dosh at the very healthy wage of forty quid a day. Toss in a few lemon meringues and the opportunities to gawp at gorgeous self-absorbed stars and it seems as though life couldn’t get much better for the locals – especially with all the attention and money being invested into the wee town. But while happy endings are the stuff of the silver screen, backstage is a completely different story. When tragedy strikes, the town is thrown into confusion over how to attend the local funeral, especially as the majority of its population are working on set. But with a multi-million dollar budget it seems inevitable that nothing and no one can stop the filming to acknowledge the death of a young man with big dreams who was caught up in the web of illusion spun by the American dream. Jones’ searing commentary on the ramifications of unacknowledged exploitation of the people whom the Hollywood industry professes to be empowering might be subsumed to a large extent by the witty conceits and caricature sketches; but the story told through the voices of a couple of ‘nobodies’, a pair of local extras, is a fitting elegy for a rapidly vanishing community. 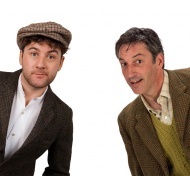 Our chroniclers of the various dramas that take place on the simple but sufficient set at the PumpHouse Theatre include the persistently optimistic Charlie (Phil Peleton) and the rather suspicious Jake (Emmett Skilton), who become instant pals. They are an incorrigible pair. Peleton proves to be an exemplary ‘cheery Charlie’ accompanied by an obsession with bonking as a sure-proof method of climbing the ladder to fame. Skilton is the perfect complement as the somewhat jaded traveller who, after his stint in the States, views the world with suspicion and a glowering resentment that gradually builds towards the film industry and all its members. But Peleton and Skilton don’t just stop at two local lads lucky enough to be extras. They display a laudatory dexterity in performing at least fifteen characters between them including locals such as ole Mickey (a gruff septuagenarian who won’t stand for any nonsense), drug-addled Sean (who had big dreams of owning his own farm with his beloved cows), as well as the rather pompous British director Simon and his eager-to-please local assistant director Ashton. Peleton’s stand-out performance is undoubtedly as the egotistical Caroline Giovanni, replete with the understated affectations requisite to seduce young men in quest of an accent lesson, making the scenes between the starlet and the young extra some of the most memorable moments of the play. Under the direction of Andrew Foster, this two-hander offers a platform for Peleton and Skilton to display their virtuosic talent as they swiftly change character and occasionally accent, often with not much more than a creative use of their peak hats and clever posturing. The energy of both performers is well-paced and while the three boxes on set find various uses during the drama, it seems a pity that the majority of the set is merely used as a pretty backdrop with the clothes rack (complete with different wardrobe options) a silent spectator. Within the character setting of the PumpHouse Theatre, Stones in his Pockets is a powerful production that weaves together moments of comedy, tragedy and farce quite brilliantly. The ending, appearing at first glance to be contrived, ridiculous and even somewhat compromising, is a most insightful conclusion. Long after the laughter subsides, the hollowness of the silver screen promises echoes deafeningly, not merely for Charlie and Jake but all those who lives ceased to exist because of it.